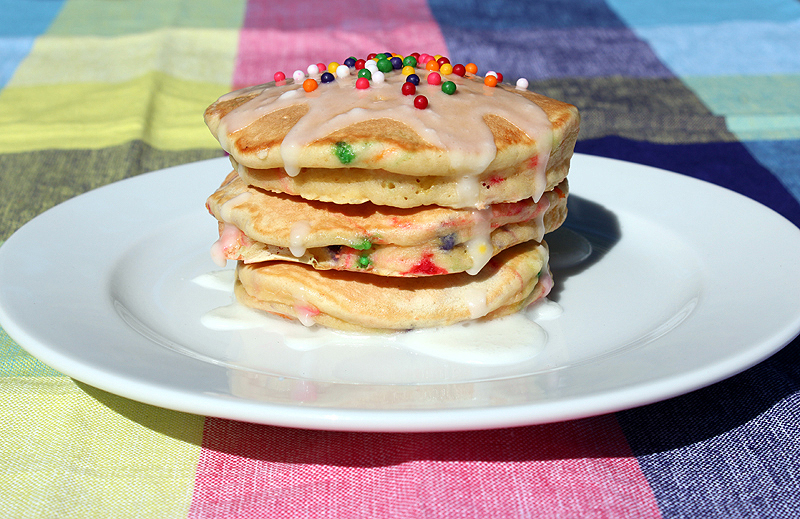 Happiness Project Recipe #15: Celebration Sprinkle Cake Pancakes! First, whisk together the flour, cake mix, baking powder, sugar and salt together in a large bowl. Combine your milk, eggs and vanilla extract into another small bowl. Pour the wet mixture over the dry mixture and stir with a whisk or wooden spoon to combine. Next, fold in your jumbo sprinkles, as many as you would like. With a preheated skillet over medium heat (lightly buttered up with a non-stick cooking spray), use a 1/3 cup measuring cup to portion out the batter into the pan. After 4-5 minutes, flip the pancake over and cook on the second side until nicely golden. Repeat with as much of the batter as you intend to use. Once you’ve cooked up all of your pancakes, stir together the milk, vanilla extract and powdered sugar for your glaze until it’s consistency is smooth & glossy. Drizzle or drop in small spoonfuls over your rainbow pancakes! And then top with MORE sprinkles, if you’d like! There’s no such thing as too many sprinkles, I say! See? Easy! So get yourself into that kitchen & get cooking! Life is all about celebrating the sweet & simple things! Especially when there’s sprinkles involved! « Happiness Project Recipe #14: Husband-Hero Cinnamon Oat Muffins!